What I collect: Worldwide USED up to the 1960's, later years from countries that came into existence after then, like Anguilla, Tuvalu and Transnistria. If it is hingeable I collect it. The background of these stamps is gray-scale. I do not know why my Epson NX510 gave them the colour tint. The 2c overprint with the CA watermark is one of Tuvalu's rarest stamps. Specimen copies are more common than stamps without the overprint. What I collect: US Precancels. Belgium Precancels. Great pages Brian, your Epirus work is fabulous, love your watermarks ID. Your image names are super. Great work all around. Top Class. The colour tint is caused by the scanners "moire" effect, happens with scans of fine lines as well. I was presuming the stamps were behind clear mounts, what is the "grey scale" you mention? I was going to upload some work, but "photobucket" is down. "weaving a basket" shows a man husking coconuts . "local handicrafts" shows a shark. Thanks Rod. I will update the pages. As for the scanner problem, I have started another thread in the help forum. The 10c multicolored, perf. 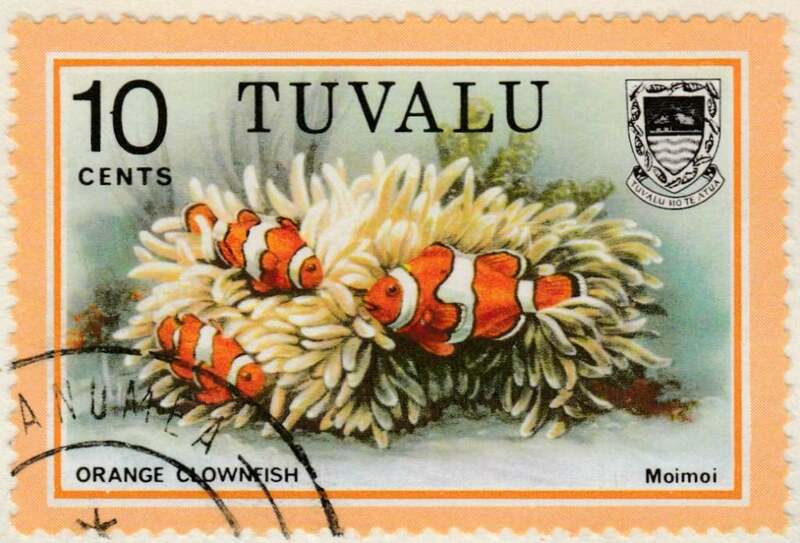 14 orange clownfish (Scott 102) from Tuvalu's fish definitive set issued January 24, 1979. Nice scan Steve. Your stamp is actually the second printing, issued in 1981. It has the coarse border and the notched lower left frame. The first printing of 1979 has a finer border, and without the frame notches. Here they are together. Thanks for the update, Brian. My 2009 Scott makes no mention of the 1981 printing, other than to note that the 45c black-tipped rock cod stamp was issued June 16, 1981. Do the notches in the frame line appear on every stamp printed or are they only associated with certain positions? They are not listed in Scott, but Gibbons mentions them I think. The notches appear on all the stamps on the 10c reprint, and oddly enough on the 25c (all printings). Even odder, they are printed POSITIONAL on the 45c stamp you mention! BC , That site provides a wealth of information...thanks for posting it. Now I wish I had more than 3 Tuvalu stamps to study!